When we were kids, my mom always made a big deal about holidays. Whatever the color theme for that particular festivity was, she would try and dye all our food that color for the day. So for Valentine's day, everything would be pink, shades of red. 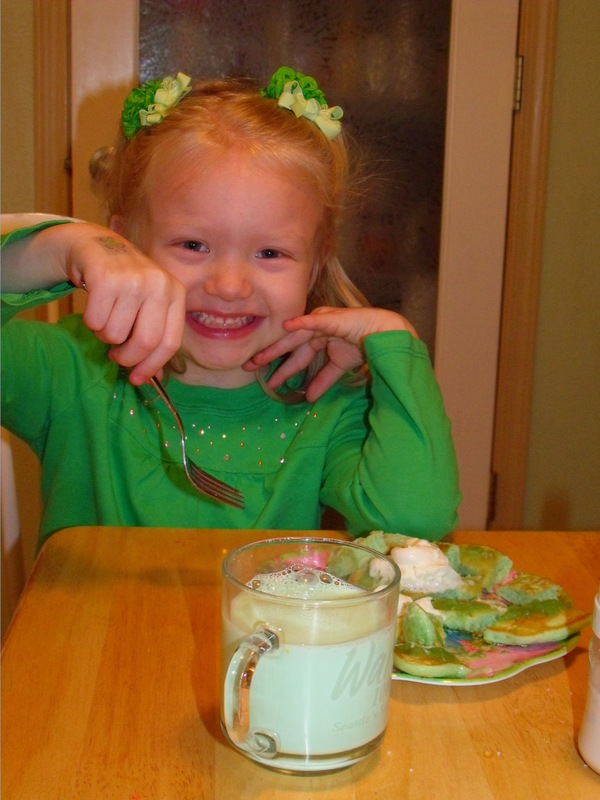 For St. Patrick's day she would dye everything green. She'd dye the milk green, the eggs green, the potatoes green, and even the french toast green. More than once she tried to serve us green tuna noodle casserole, which, let me just warn you is a clear test of "mind of matter" and sheer will power to eat. One of our family favorite meals for St. Patrick's day that I have carried on to my own family, is quick, easy, and can be served for breakfast, or dinner. 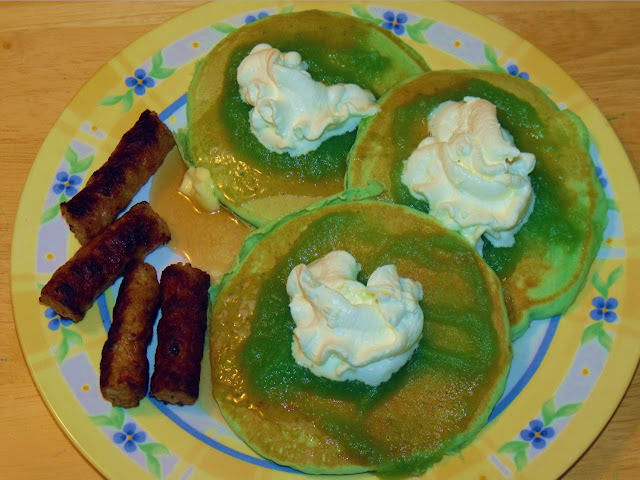 St. Patrick's day pancakes, with warm brown sugar applesauce and whip cream. Of course these are just your regular run of the mill pancakes with some green food dye added, but the topper is what makes this dish divine. Take some homemade applesauce (store bought works too) and pour some into a small pan on the stove and warm up. Add a dash of brown sugar and heat until the flavors blend. You can do this anytime of year, but be sure to dye it green for St. Patrick's day. Then, pour over warm waiting pancakes. If you have never had apple sauce as a pancake topping, you are in for a real treat. Think warm apple pie... it's totally to dye for (pun intended). You can even get all extra fancy and turn the whip cream green and add green sprinkles too for that extra big "WOW" factor. It's sure to be a new family favorite in no time, and I promise your little Leprechauns will gobble it up . Oh and for goodness sake, don't forget to dye the milk green too. They go together like green eggs and ham!